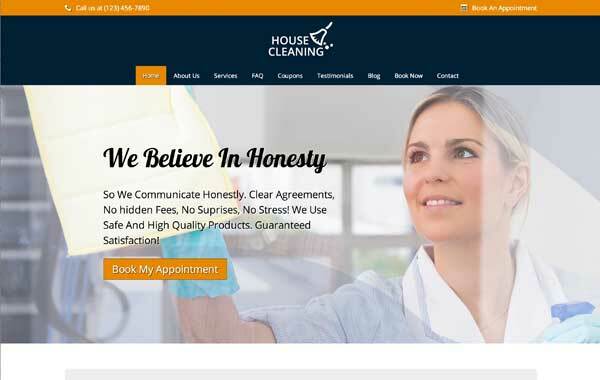 Convey professionalism and trustworthiness through a great-looking website built with the House Cleaning WordPress theme. Offer visitors neat rate charts, coupons and online booking to convince them to hire your cleaning company to make their homes sparkle. It's your turn to hire someone else to do the dirty work! 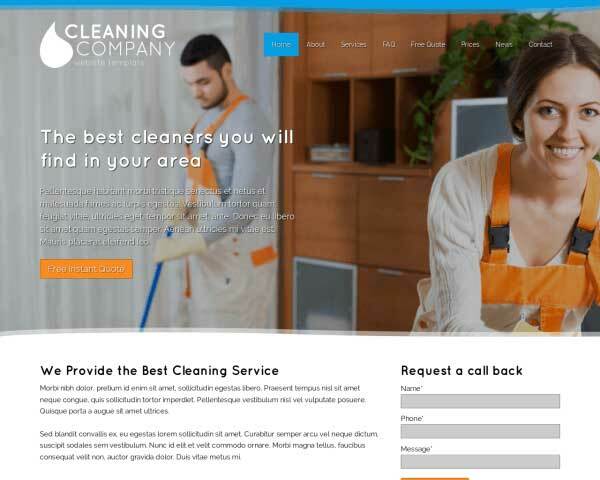 With the House Cleaning WordPress theme, we've already done all the heavy lifting in building a sleek, professional website for cleaning services, so all that's left for you to do is fill in your own text and images. This premium WP theme allows you to offer clients online appointment booking, clear price lists, FAQs and reassuring testimonials from happy customers. We've also included powerful features to help grow your cleaning business, like integrated social media options and a simple SEO manager to boost your search engine rankings. Customize the colors and page layouts using our intuitive front-end editor. No coding is required and convenient drag and drop widgets make it fun and easy. 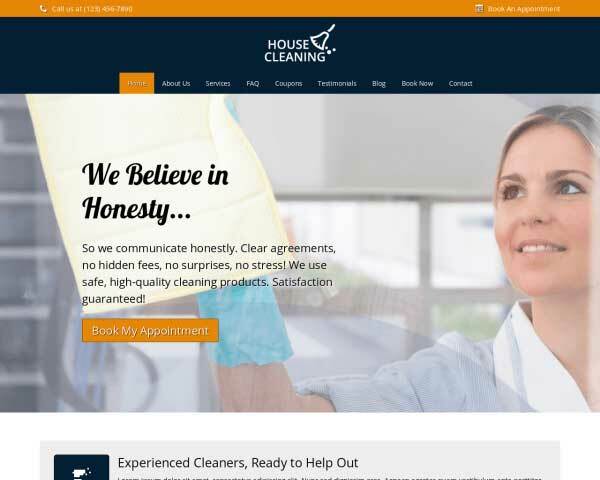 Take a look at the demo site and imagine the possibilities for your professional housekeeping services when you create your website with the House Cleaning WordPress theme. 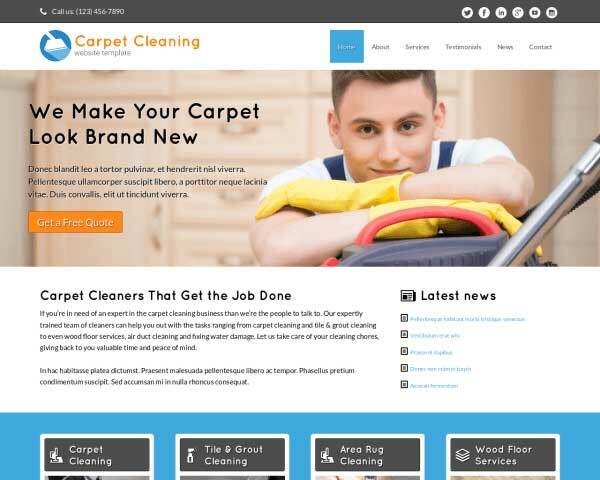 It's WordPress so the House Cleaning WordPress Theme can't do without a good blog overview, which also is an excellent way to attract more visitors. 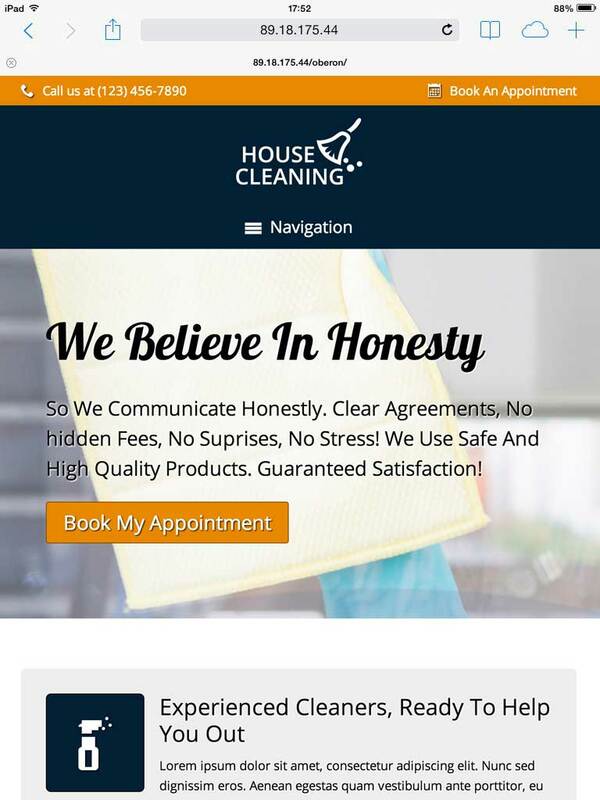 One of the main assets of the House Cleaning WordPress Theme has to be its online appointment booking form. You can change the fields as needed and greatly enhance your online business. 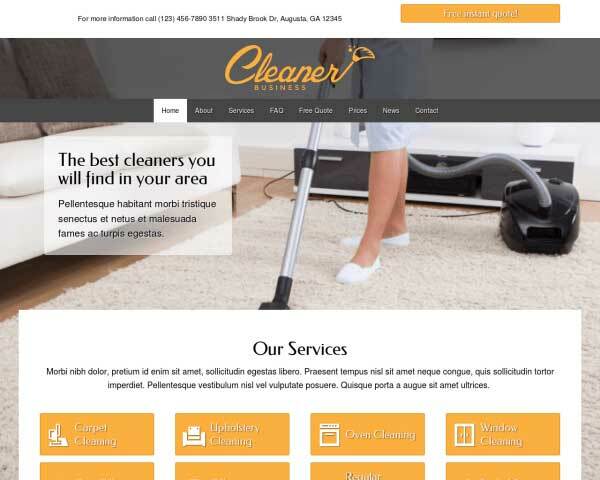 If you're in charge of creating the website for your business but have little time or web design skills, our House Cleaning WordPress Theme will help you get a comprehensive website online fast! 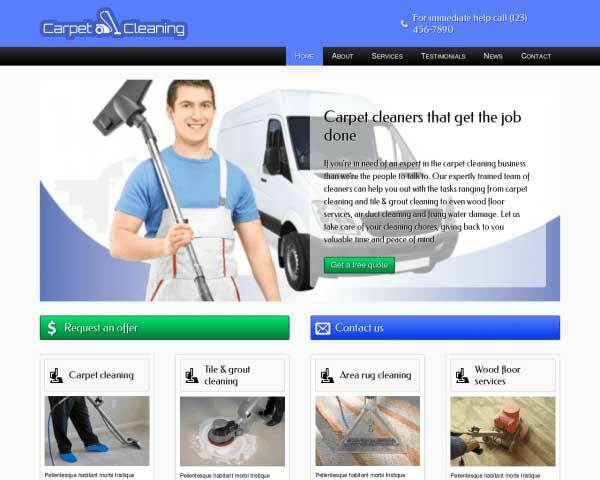 We've included a page for coupons and promotions with this WordPress theme for cleaning companies. Images and buttons can be linked to a PDF file that customers can download or print. 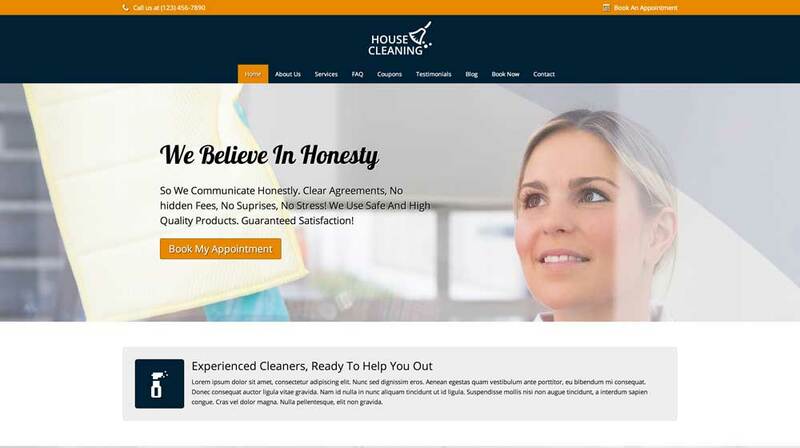 With clear distinctions between the questions and answers, the House Cleaning WordPress Theme's FAQ page is ready to be filled with your most frequently asked Q's and A's. 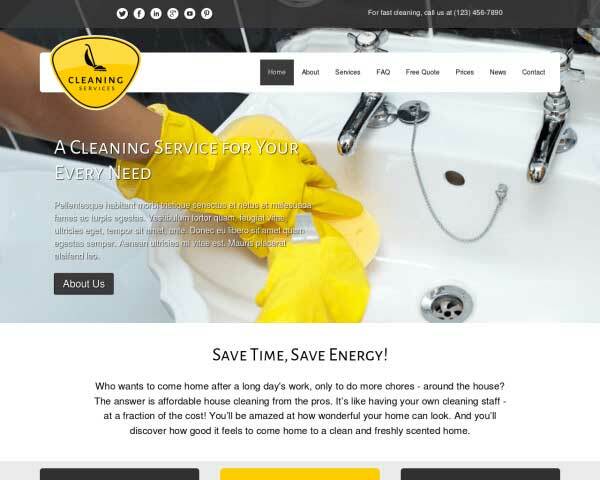 The House Cleaning WordPress Theme comes packaged with sharing and following icons for popular social media platforms, and widgets that display a Facebook or Twitter feed. New clients are understandably wary when inviting strangers into their homes for cleaning. Add an extra layer of trust to your online presence with a website that looks neat and professional at every screen size. 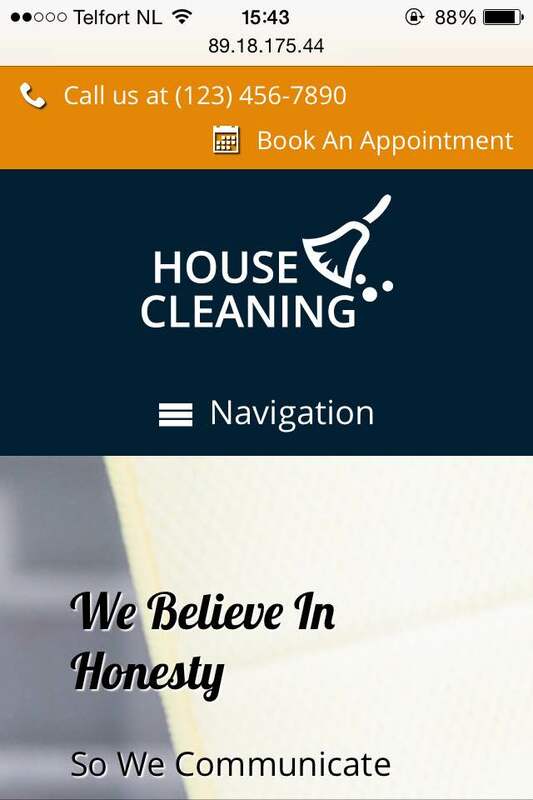 This responsive House Cleaning WordPress theme is built to automatically adjust your pages to display beautifully even when viewed on smartphones and tablets. Mobile visitors can simply tap your phone number to dial and schedule an appointment or fill in the online booking form just as they would while viewing your website on any laptop or desktop browser.